"My first Texas deer hunt was the best hunting experience I have had in twenty years of hunting. On the first morning, three of the finest bucks I have ever seen came to the feeder and I couldn't resist. King Springs Ranch put me on my biggest buck ever." "On the first morning of my hunt I saw several deer including a nice 10 point which I passed on. When he showed up the next morning I couldn't pass on my second chance. 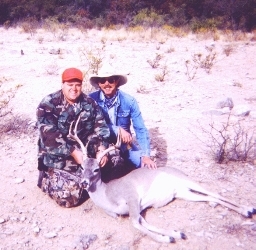 King Springs Ranch is a great place to hunt and watch lots of deer." "I saw several bucks and hunted several feeders on my first trip to King Springs Ranch. On the second evening I shot a nice 8 point. I enjoyed the trip, accomodations and hunting." "This was my first time to hunt so far away from home and I had a wonderful time. On the second morning of my hunt I shot a nice 17 1/2 inch buck which I had passed on the previous day. I hunted several feeders and saw a lot of deer and rugged country. The ranch is well managed and maintained with great accomodations. Before I left I put down my deposit for the 2000 season. I look forward to hunting on King Springs Ranch opening day." "This trip was a wonderful Christmas present to my father. King Springs Ranch offers excellent service, comfortable living quarters and great meals. Dad and I each shot our best bucks yet. This is a great hunting opportunity." "On the first evening of my hunt I couldn't pass up a very high 12 point buck. This was my first trip to west Texas and I had a great time."